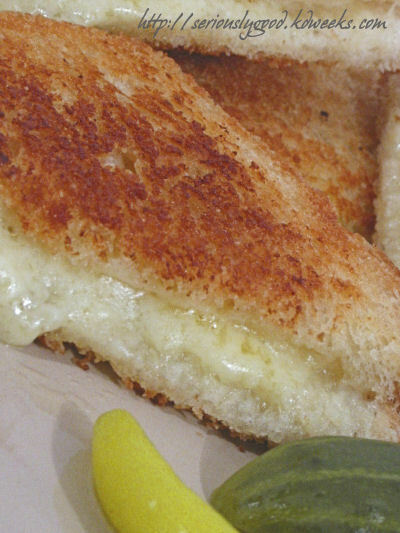 It’s National Grilled Cheese Day. So I present to you the Ultimate Grilled Cheese Recipe. Homemade Sour Dough bread, along with Grafton One Year-Old Cheddar, and some exacting steps and measures yield an amazing grilled cheese sandwich. This recipe from the late Kevin D. Weeks was inspired by James Beard’s Sour Dough Bread recipe from his “Beard on Bread” book. Chef Kevin Weeks was a regular contributor to NPR as well as creating the first Wordless Wednesdays posts on About.com. In honor of Kevin D. Weeks’ passing in April of 2012, below is his exact post (no longer online) detailing his amazing Ultimate Grilled Cheese Sandwich recipe. (I’ve not reformatted the post in any way, but I may “fix” it up when I have time). This was the second post I made on this blog, sort of ironic that it’s about a grilled cheese sandwich. I decided to repost it when I happened to run across it because whenever I describe this sandwich almost everyone wants to know about the bread.